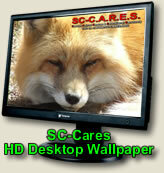 A great way to give to SC-CARES when you shop at Amazon.com! If you start shopping Amazon from here, SC-CARES receives from 4-10% of the sales. Shop for any item at Amazon by searching on the right, or checkout our selections of wildlife and cruelty free products below. Either way Amazon will give us 4-10% right off the top! And don't forget to tell your friends and bookmark this page!